Haesje Claes is located on Spuistraat, just down from the Flower Market on Singel and opposite the NH City Centre Hotel and the Amsterdam Historical Museum, close to Dam Square and the Royal Palace. It’s a really good spot, easily accessed from several of the main tourist attractions. We went on a Tuesday night and were able to get a table straight away, but booking is advisable especially at weekends. Even so early in the week, tables were full; this is a popular place. From the front, Haesje Claes looks a small place, but appearances are deceptive as the restaurant stretches backwards and sideways on two floors in six inter-connecting buildings. There are six separate dining rooms, all retaining the beautifully preserved architecture and decorated with pictures from the Amsterdam Orphanage founded in the sixteenth century by Lady Haesje Claes in the style of that time. 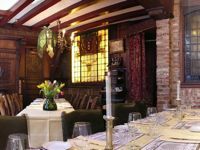 We were seated in the oak paneled Blue Dining Room on the ground floor – look out for the traditional Dutch tiles and the beautiful ceiling. The food is old-fashioned Dutch cuisine. Starters include salted herring for €7.50, smoked ham for €8.50 or the fish hors d’oevre (trout, herring, mackerel, shrimps and eel) for €15.75. We went for the Chef’s Soup of the Day at €5.25 and Westland Mixed Salad for €7.25. The soup was a creamy white asparagus and the salad was crisp and tasty, dressed in a very light vinaigrette. Main courses are all served with potatoes and fresh vegetables. Prices start from €15.50 forstamppots (traditionally Dutch, a casserole of potatoes, bacon and sausage) or chicken dishes, through to lamb in port and thyme sauce at €22.75. I picked the pot au feu of leeks, potato, cabbage, egg and butter at €15.50, one of two vegetarian options. My co-diner described her Dutch sirloin beef-steak served with Bearnaise sauce (€16.75) as juicy and tender. Desserts range from apple pie with cream and cinnamon sauce for €3.25 to a light pancake at €6.75 served with orange liqueur, cream and ice-cream, or the cheese-board at €7.50. Haesje Claes serves a full range of international wines. The white ranged between Spanish Macabeau at €19.50, to a French Chablis for €33.50, with reds priced slightly higher. As we were dining Dutch we opted for a €21.50 bottle of Pinot Gris from the De Schorre vinyard in Zeeland. It was fresh and sweet, and combined well with our meal. Instead of dessert, we opted for a shot each of Jenever, the juniper-based traditional liquor of Holland. Our waitress recommended the Oude Jenever at €2.50 for a shot, which was pleasant but similar to drinking neat gin, whilst the €2.40 shot with Berry flavour was reminiscent of Sloe Gin. The whole meal was enjoyable, and came to a reasonably priced €71.65 for two courses each plus the wine and the Jenever. Service in The Netherlands is often slow, but our waitress was friendly and we did not have to wait either to either place our orders or for the bill, which can be frustrating in Amsterdam. Haesje Claes is definitely worth a visit, as much for the interesting architecture and setting as the food. But it’s busy every night, so booking is recommended.